What do you get when you violently collide the Grammy and Academy Award winning songwriter of such hits as "Baby It's You", "Close to You", "Walk On By", "Always Something There to Remind Me", "What's Up Pussycat? ", "Do You Know the Way to San Jose? ", "Raindrops Keep Fallin' on My Head", "I'll Never Fall in Love Again", "Arthur's Theme" and a bajillion other songs with the most badass Wookiee that ever shot down an Imperial Cruiser? 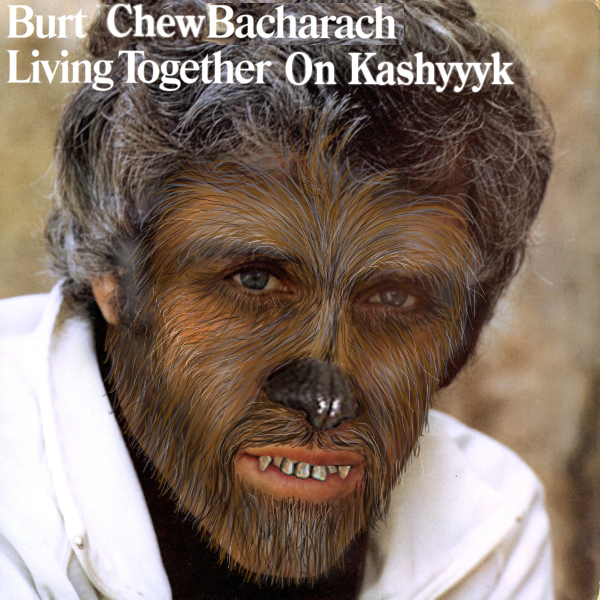 Why, you get Burt ChewBacharach! That's who!